You guys know the drill. The signs of the impending apocalypse include war (check), famine (well, I am on a student budget…cheee-eeeck), horsemen (could we count the motorcycle riders who pop wheelies outside my window at 3 AM? ), and the plague of locusts that terrorizes the earth for five months. Well, I don’t have locusts. But we do have bedbugs. I am not an inherently dirty person. I wash my sheets, I vacuum regularly, I clean the kitchen after every meal. I don’t have cockroaches crawling up my stove, I don’t pick ants out of my food before I eat, my shower doesn’t look like the tin man was murdered in it in the last month. I don’t live in the ghetto. Well, that’s a little up for debate, depending on your point of view, but I do not live in a one-story walk-up where the stairwells are poorly lit, you have to shove a crackhead out of the way to get to your door, and the hallways stink of human excrement. Nope. I live in a sunny, tidy, two-bedroom town home in a suburb of Los Angeles. Pretty basic, right? I don’t have a drug problem. Or an alcohol problem. I don’t have any other problems coping with daily life, etc. So, now that that is out of the way, here we go. And if you are grossed out by the thought of small bugs crawling over you while you sleep, I actually strongly consider that you screw your courage to the sticking point and hear me out. Because prior to two weeks ago, I thought “Well, bedbugs will never happen to me!” And now they have, and my learning curve was fierce. Do yourselves a favor and learn yourself something, because this, my friends, is the coming of the apocalypse. It all started one fine day in Riverside. I had just met our new neighbors the other day, they seemed quite nice, and had just moved in about a week ago. Day 1: I wake up with a mysterious bite or two on my arm. They itch fiercely, but I think “darn mosquitos” and carry on with life. Day 2: More bites erupt. They are itchy in a way that is hard to describe, but I will try. Think about your average mosquito bite. It itches if you brush against it, right? It itches sometimes even if you’re leaving it alone, but you can generally ignore it after about a day. These bites are different, and my body knows it before my brain does. They itch CONSTANTLY. If the bites had something to say, it would be a constant, running refrain of “ITCHY ITCHY ITCHY HEY HEY HEY ITCHY I’M ITCHY”. And then they start to swell. They get big and red and ugly and they are everywhere – my legs, my back, my stomach, my arms, my hands, my feet. Day 3: I open my eyes in the morning and my brain suddenly and elegantly connects a thousand dots in this Connect-the-Dots of life at the same time I notice a small (but engorged) bug WADDLING away from my body and making a beeline (bedbug line?) towards the headboard. I squash it on instinct and my blood comes out. I LEAP out of bed in a Matrix-like move that you wouldn’t even believe, squealing “BEBDUGS NOOOOOOOOOOO BEDBUGS NOOOOOOOO” to myself as I rip the sheets off and begin my frantic search for these diabolical creatures. Let me pause for a minute. A couple of years ago, there was a hysteria about bedbugs, remember? Big cities suddenly had outbreaks that defied all traditional pesticides and horror stories loomed on the internet about people having to burn down their houses and throw out their furniture, etc. etc. Well, needless to say, I found a collection of fully grown bedbugs nestled up all drowsy in the box spring and mattress, sated from their last “blood meal”, which is the horrific name the entomologists give to these vampiric little fuckers sucking your blood out in the middle of the night. Commence naked and hysterical steaming of all bed surfaces with iron. Commence ripping off of every single article of clothing, bedding, and any soft goods found on, near, or within a five mile radius of the bed. Commence ordering of every bedbug supply I can find on Amazon.com with same-day delivery. I have an atypical reaction to the bites. Borderline anaphylactic. Mine swell up, become infected, and generally cause a localized reaction that startles even other healthcare professionals. You can easily use Google search to realize your worst fears, and if you want to see what mine looked like, type in “beginning stages of leprosy”…the pictures that haven’t ulcerated open yet are only a slight exaggeration of what I was dealing with. Not everyone reacts the same to the bites. Victor (of course) barely ever gets bitten and when it does, it itches gently for about two hours and then goes away. Typically, you get a triangular series of small red marks (or a line), usually three: breakfast-lunch-dinner. By the time the dust settled on that fateful day, it was like the midpoint in a horror movie, where the music suddenly dies down, and all you can hear is the quivery and snotty whimpering of the heroine and some sinister dripping of water somewhere as the camera pans across some dark dungeon somewhere and finds our heroine naked in a corner, shivering and covered in cuts and bruises. And all you can think is that you KNOW the bad guy (or bug) isn’t gone, because you KNOW Amazon Prime said the movie was 114 minutes long and it hasn’t been that long yet. And you would be right. The horror is just beginning. Victor took the next day off of work, because I was in such a state of emotional distress that I wasn’t sure I would be able to survive. I woke up with yet more bites, indicating a lack of effectiveness in my methods of abatement, and strongly considered taking a blowtorch to the bed. And the bedroom. I left with prescriptions for prednisone (a potent oral steroid that brings down swelling, etc. ), a topical hydrocortisone cream (rub it on, instant relief) and Keflex (a potent oral antibiotic, due to infected nature of bites and also possibility of bartonella transmission, which is a lesser known cousin of Lyme Disease). Horrifyingly enough, these vampiric little scourges can live on in a semi-hiberating state for six months or more without a blood meal. You are likely to have multiple outbreaks that will require constant vigilance to abate. 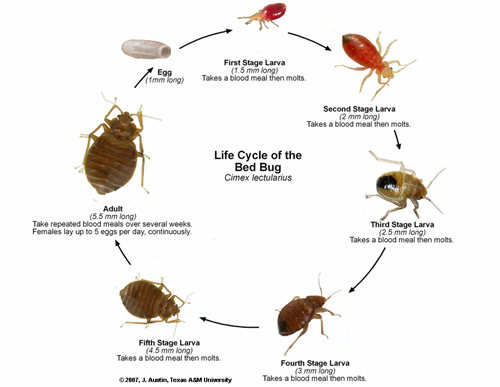 Bedbugs are interestingly the only insect infestation that is mentioned in conjunction with “get thee to a counselor” and other talk about the psychosocial aspects of dealing with an infestation. More on this later. They are TINY. The nymphs are less than 1 mm long, and the adults are about the size of an apple seed and reddish-brown. Therefore, you often can’t even see them. They inject a numbing agent as well as an anti-coagulant, and it takes them less than 15 minutes to complete a full meal. Therefore, you rarely witness the biting and you almost never feel it (skin crawling yet?). There are a couple of telltale signs of bedbugs (that we had in spades, once I knew what to look for): blood spots on your sheets (from rolling over and accidentally squashing them as they move away from you), moltings and feces on your box spring and mattress (looks like little black flecks), and of course, the bites. They feed based on carbon dioxide and warmth, so they can and will follow you places. They are tenacious, hardy, and difficult to kill, since fumigating has virtually no effect on them. Contrary to popular belief, you are not covered in them (like lice), and they do not travel as adeptly as people are led to believe. It’s highly unlikely to get them through casual contact with clothing, bags, etc., because they don’t move that fast. They commonly and easily travel through common walls (we believe we got them from our neighbors), electrical outlets, baseboards, and through extended contact with things like luggage (if your hotel room has them, for example). I’m going to mention the psychosocial aspects of bedbugs right now, before I move on into what we did to kill them. UpToDate, the compendium of basic information for healthcare providers, talks about “feelings of self-isolation, shame, insomnia, and general helplessness”. Victor and I both experienced this, although me more so (because Victor could easily sleep through the apocalypse, wake up and ask “What’s for breakfast?”). I spent several sleepless nights on the couch, saw small black crawling things everywhere, dealt with fierce and constant itching, AND was trying to abate them at the same time. It’s crazy-making. You work all day on the bed, washing sheets, vacuuming, steam-cleaning the carpets, etc., and then you leave to take a shower and when you come back, there is a BUG on your BED. And you seriously just want to break down and sob. We are still fighting, but we’re getting better at it. Here is what we’ve done, and maybe you can learn something from it. Strip the bed down. ALL THE WAY DOWN. Vacuum mattress and box spring, inside and out. Vacuum and steam clean the carpet under the bed, around the bed, and any head and footboards of the bed. Pay special attention to cracks and crevices. Steam clean the whole bed, using the crevice attachment to spray molten steam into every corner of everything you can think of. Coat liberally in bedbug spray. Wash all linens with bleach. Wrap your mattress and box spring in the bags, and don’t take them off for a year. Reassemble the bed and coat surfaces and surroundings of the bed in diatomaceous earth (it’s a mild irritant to the eyes and respiratory tract, but otherwise non-toxic). Repeat, ad nauseum, on days 2-80,000. As of right now, the last 48 hours have been bug-sighting free, and I, the canary in the coal mine, await to see whether the next 48 hours bring me new bites (indicating further need for treatment). We steam the whole bed every day, vacuum religiously, wash the sheets with bleach once a day, and wait. That’s the long and short of it, kids. It’s been a sobering experience so far, it’s not over yet, and all those other cliches about it being a marathon and not a sprint, a war and not a battle, blah blah. They’re all true. True. True. True. And the self-isolation and other psycho-social aspects stand, too. I found myself creeping around the house with all the blinds drawn peering into corners with a flashlight on more than one occasion. And as if that wasn’t ironic enough, bedbugs only have one natural enemy: the cockroach. September 5, 2014 in Sustainable.